Well as you can imagine yet another Jool mission ended poorly. We loaded all of our remaining fuel into a lander and sent them off to process some ore. Moving really fast, but maybe some aerobraking would work? They thought an inflatable heatshield and some parachutes would let them land safely on Laythe. Oops. (Haven't tried a Laythe landing since before deadly re-entry). Anyway in the end they did not burn up in the atmosphere, but now they are out of fuel in a distant Kerbol orbit. Time for a rescue mission I suppose. Who can we trust to save us? Valentina where are you? Oh, your ship got ejected into interplanetary space while we were busy fast-forwarding to Jool. Excellent. Anyway Plan B, build a fuel heavy rescue ship. This took forever to get right, getting to orbit was a major challenge. Who will crew this thing? 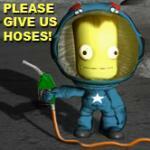 We are out of Kerbals, and the astronaut complex wants 500k for mostly engineers. But wait... we have a long-forgotten MunBase not doing much. So let's get it back to low-Kerbin orbit and restaff from there. Next plan is to top off on fuel and launch the rescue mission. Well, that's definitely a problem Next time, you might consider using gravity braking off 1 or more big moons. We have a ship design we like, but it only can get to orbit with half a fuel load so I guess it's time for endless refuel missions. We've updated our ship design two have two escape pods. A bit hard to deflect probing questions, such as why a ship that can hold 17 crew only has escape pods for 2 passengers. Our stripped-down refuel ship eventually stopped crashing and started delivering fuel. We sent some engineers and scientists along on the robot-piloted ship (the KSC is all out of pilots it seems) to build some experience. Or they'd build some experience if their landing craft stopped crashing. Eventually we sorted out the parachute problems and the ghosts of the sadly departed helped finish the refueling. Let's hope the next update is more exciting. Returning to Jool yet again, maybe this third time we'll have enough fuel to do interesting things there. Damn, so many expensive dead Kerbals. You must be about broke by now. Well, I think the ghost Kerbals don't cost any money to recruit, do they? They just show up haunting the astronaut complex. Though I have to admit I have been cheating a bit with the funds. I feel like it's only fair, as a bug in the game wiped out a huge pile of almost-complete contracts a while back. In the meantime a shadowy cabal has sponsored a Dres mission. I think they found one of those "Vacation on Sunny Dres" fliers. This involved some poorly-thought out rover design, as well as the usual round of tedious refueling. We tried sticking parachutes on our refueler boosters in hopes of recovering some funds, and that was a bit of a disaster until we sorted the staging out properly. It's a pain getting a Dres intercept, I feel like it's easier to get to Gilly. We're continuing with our mysterious mission, which involves the launch of two more giant rockets, this time equipped with mining equipment. Guess what we get to do next? Docking and refueling! Fun fun fun. One of the ships was missing an engineer, so we sent one. And of course we sent her to the wrong ship. Oops. Measure twice launch once I guess. We finally got all of that sorted out and waiting for launch windows, so it was time to bring in a few contracts. Collect Component D06Z-Q? Good thing our refuel ship had a claw. It turns out to be an empty solid rocket booster, and surprisingly the landing was completely uneventful. Data from Minmus? That's what Minmus base is for. And it turns out we had 500 science queued up in our lab (I had been avoiding checking in for fear of all the landing legs exploding. Luckily they didn't despite some scary warning messages). Transmitting 500 science takes a *long* time though, good thing we had lots of solar panels. One last thing, we had reports of anomalies just to the NE of the base. Let's send Gregwell out to invetigate, it isn't far and this doesn't sound at all like the plot to a horror movie. He gets there... nothing. But wait, says mission control, go a bit further to site2! OK. Nothing there. How about site3? We're getting a bit far from home here but OK. Nothing there. Site4? Well nothing there and now we're out of EVA fuel. Great, poor Gregwell. Was this some sort of prank? Or is the Kraken trying to separate my poor Kerbals so it can take care of them indivdually? Poor Gregwell, we couldn't really make him finish his Minmus patrol on foot, so we sent him a rover at great expense. And then Wexny stowed away on the ship against orders. We stopped at the Minmus asteroid along the way to refuel the robot ships there, and left Wexny there, maybe she'll think twice next time before sneaking on a ship. We landed the rover and it managed to mostly work despite landing upside down. One of the wheels was broken, but by using the rocket thruster we managed to get along OK. Even with the rover it too Gregwell a while to check off the three remaining sites before finally mission control declared the scary readings to be sorted. He still suspects he was being hazed. With Minmus sorted out, it was time to continue with our launch schedule. The window to Eeloo opened and we launched Phil-zor and crew on their way. We wasted a lot of fuel on this, as the nuclear rockets are slow to accelerate so the burns start early in the orbit and the maneuver nodes don't seem to compensate well for this. Hopefully we have enough fuel left to do something useful once we get there. With minmus sorted, it was time to launch the Gilly ship. The trip there was uneventful, and they landed and mined some fuel. They had landed on a slope though and so they ended up sliding down the hillside, mining all the while. Eventually it leveled off a bit. Rabies left her companion behind to run some errands. She was hoping that at least one of the two Kerbals in distress in low Eve orbit was a pilot. After a lot of painful orbit matching she rescued the two, who turned out to be twins. They were also both "scientists". Tough luck. Then without warning one of the twins staged the lander with Rabies inside. Rabies was forced to unexpectedly land on Eve! Luckily the lander survived, but now she's stranded. Could she at least finally check off that data-from-Eve contract we hae? No! Three landers on Eve and somehow none of them have an antenna. The mystery twins went back to Gilly to refuel (as somehow the Gilly->Eve trip took more fuel than Kerbin->Gilly did). Who knows what nefarious things they'll be up to next. What to do while waiting for ore mining on Gilly to complete? We still have a while before the outer-systems ships get to their destinations. Hmmm we seem to have started tracking some Class-E asteroids. I guess we should do something about that. At great expense we recruited a new pilot (the astronaut complex *finally* refreshed) and eventually launched a ship to the first asteroid. The underpowered SAS and level-0 pilot conspired to make it impossible to capture the asteroid before it left Kerbin's SOI. We did manage to get the ship turned around and after some lengthy aerobraking managed to land it in more or less one piece. We refurbished things, added SAS, and the now Level 1 Tanrod was sent off to try again with Asteroid 2. After a number of explosions/unexplained warps we discovered it was a bad idea to try to use the claw at exactly the moment we were re-entering Kerbin's SOI. We had just barely enough fuel to capture the asteroid out beyond Minmus. Now that we have it we need to figure out what to do with it. Updated to 1.2 which has gone well so far. Did not enable comm-net yet. That might go OK, although I currently have too many plans that involve scientists/engineers in landers. Anway, our brave crew of Nedbury, Kimchee, and Mac-nerd have finally made it to Dres! Let's see if those tourist brochures were lying. Anyway we sent Kimchee down in a lander, first attempt to land these things w/o a parachute. Mostly went OK, only lost a docking ring in the process. She landed by chance near the prominent canyon. We had also been dragging a rover the whole way there, so we sent Nedbury down in that. We were hoping to land near a probe we sent years ago, but ended up landing in the pitch dark. Remarkably that went well although we ended up landing upside down and broke a solar panel. Mac-nerd and the orbiter are on their way to meet an asteroid we had accidentally started tracking a decade ago. Far enough out that that's going to take a long time to get there, and in the meantime some other missions are going to start reaching their destinations. The troublesome twins on Gilly finished refeuling and went off in search of a Pilot. Orbital Mechanics were not in their favor however. Around scenic Dres, Mac-nerd was having trouble with off-axis thrust now that one lander was gone. So he detached the other lander in hopes of docking it in a more central location. He wasted a lot of time before he finally realized the lander had a clamp-jr and the mothership was regular sized. He eventually just abandoned the lander (no!) and did manage to snag the asteroid and pull it into low-Dres orbit where he's awaiting orders. Our brave three-Kerbal Eeloo mission arrived and has no trouble entering orbit. The plan was to land and refuel, which had gone so well on Gilly. Somehow they didn't take into account that Eeloo has a lot more gravity. After lots of "simulations" where the ship kept tipping over and exploding the detachable command ship, it was decided that Phil-zor would have to separate the top at the last minute and let the ship land on its side. If only we had thought to mount one of the drills 90 degrees off we'd be doing fine. Enough for one day, we also have a crew arriving at Jool more or less simultaneously but that will have to wait until the next update. The mission to Jool finally made it, and we dimmly recalled it was some sort of rescue mission. Yes, there they are, ran out of fuel trying to get to Pol. Sherbert and Gwenlin managed to match orbits, dock, and transfer some fuel. So it looks like Robert is going to try to land on Laythe. Viremma decided it would be best if she stayed with the newcomers. While Robert braked into Laythe orbit (polar, but not polar enough for the resource scanner to work) the rest skipped across to Tylo for unknown reasons. In the middle of all this the pirate twins made a massive burn near Eve, wonder what they are up to. Robert landed on Laythe (finding land was hard) and then his ship slid a long way, but eventually came to a stop. First Kerbal on Laythe! No ladder though so he can't get back into the ship (it slides down the hill whenever he tries). Soon after the other Jool mission arrived and parked in Bop orbit. At more or less the exact same time the pirate twins had caught up with Valentina (a lot of careful switching back and forth happened here) and she reluctantly agreed to team up for the time being. Back near Jool, one lander made it to Bop no problem (we even had a contract for that). Another managed to make it to Val and while Ludbert survived the landing somehow, his ship did not. (And he was stuck in "on ladder" state which took forever to figure out how to fix). We're now so close to completing operation Patillas. Last step is getting someone down on Tylo. Is it possible? Can we land our giant ship successfully? The answer seems to be "no". Frustrating.